We didn’t expect this. 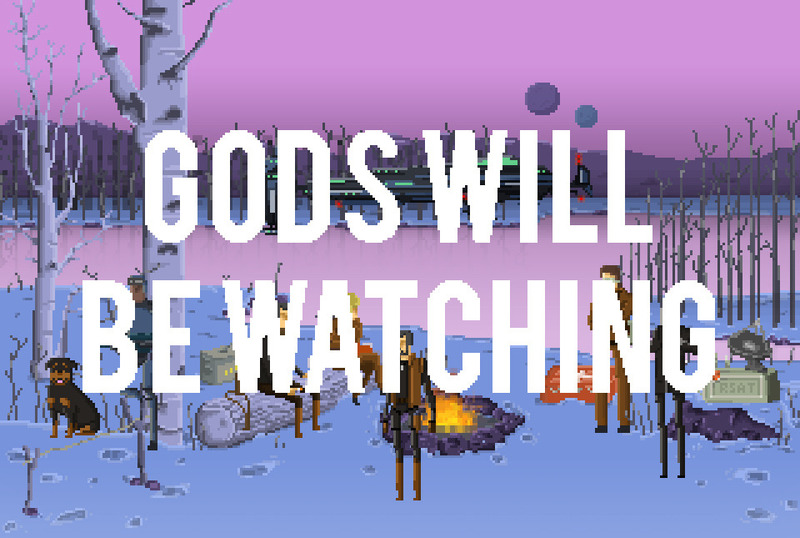 Gods Will Be Watching was our little minimalistic puzzle game for Ludum Dare 26, and we were happy with it, but, seeing it appearing it all over the internet, and receiving more than 10.000 plays per day was totally unexpected. We are overwhelmed. Took us several days to recover from the 72 hours effort and being able to face all of the blog posts, tweets, mails, gameplays at youtube… we need to thank so many people!!!! Also the game got featured on Game Jolt!! We hope so! Since the game got a great acceptance both by press and public, and a lot of people told us they want more, we’d love to expand Sgt Burden’s and his crew universe. A lot of ideas came to us during this week on how to develop the game concept further without losing his essence, and we are thrilled with what we have to offer in the future, so stay tunned! This entry was posted on Saturday, May 4th, 2013 at 9:32 am	and is filed under LD #26. You can follow any responses to this entry through the RSS 2.0 feed. You can skip to the end and leave a response. Pinging is currently not allowed. You guys really did an impressive job. I’ve played this game over and over again, and when I finally beat it, not only was I able to recount what happened like it was a story, but I wanted to play it again and do better. Not to pile on the accolades, but you really succeeded at packing a lot of drama and storytelling into such a small game. I’m glad to hear that! One of my objectives on this LD was to fill the game with a lot of soul, whatever I made. The Minimalistic theme at first discouraged me, but it follows that it’s been a great diversifier for making some nice and simple emergent narrative. Thank you for playing!! I created this account because I feel it was inappropriate for me to take such an immense pleasure in a game without having anyway of expressing that pleasure directly to the one who not only created it, but distributed it for free. I feel this game is of a quality I would most certainly pay for, and if giving the opportunity, I would pay for it immediately to obtain a personal copy that I might cherish and experience again at my own personal leisure. I stumbled across this game in a link on deviantart.com, and, shortly following that single mouse click, I managed to lose several hours of my life to your game. This game was a perfect blend of simplicity, and complexity. Its extremely difficult to beat, yet extremely simple to learn, not only that but every experience is self-taught through the act of playing. My first day, froze to death, lesson learned. This is a feature that is extremely sought after in game play, and only the greatest of games seem capable of mastering it. In addition to that, your game is so…intense, without making you consciously aware of its intensity. Subtle things change in the game that bring the player into the game, such as the sanity of the survivers as it slowly decays or the sounds of the crackling fire. The first few times I played it, I was completely indifferent to the game. I thought, huh, I’ll click and play this just a few times and move on to something else, but the very moment I saw the option to ‘kill’…I thought. “What could this be?” So I did it, not even partially comprehending the magnituted of my action, that same day, I died of hypothermia. Instantly I was taken. I had to know what would happen if I had lit that fire, and the adventure began. From there, attempt was both frustating and exciting as I got closer and closer to saving everyone. I even invited my friend to watch me play. We both became so excited as we played for at least an hour and a half, testing out might to see if we could survive. My friend became so enamored with the game she nearly strangled me when I was forced to kill the dog just a few days before our rescue. It was a wonderful humorous experience created by very guilty emotional game, that makes you feel more than you’d expect a pixelated game could. Perhaps, the utmost important and engaging feature of them all was your selection of music, a song that has been stuck in my head for several hours longer than I actually played the game. That music…pulled this masterpiece together, a masterpiece I enjoy and admire to no end. For that, I give you my endless respect. You made me feel a great deal of emotion for pixels, from a game you created in 72 hours. You mind is a great a beautiful mind, you must use it to continue to create great and amazing games. After taking a break from playing Gods Will Be Watching (a genius title by the way), I began playing some of the other games in your gallery and I must say, you have great potential, especially after playing Ages of Irving. You see my philosophy has been and will always be, “it is not the execution, but the concept.” This is how simple games can become so entirely consuming as yours are. Please, continue to make games, and perhaps, teach the industry how its done. You have given me an entirely new found respect for Indie games. Thank you. Thus concludes my fangirl rant. 24 queries executed in 0.082 seconds.